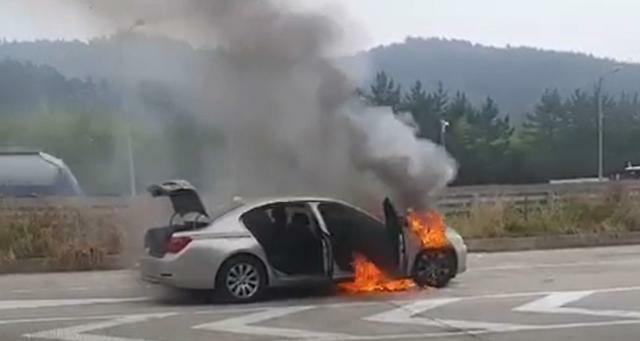 SEOUL -- Two more BMW sedans were burned down on South Korean highways Thursday as car owners demanded a criminal investigation into top officials of the German company and its local branch to see if they tried to cover up evidence on faulty parts. A BMW 730Ld model was gutted after a fire broke out on a highway in the southeastern city of Sacheon. One hour later, a 320d model caught fire on a highway just south of Seoul, becoming the 36th car to catch fire. Nobody was hurt from Thursday's accidents, but the transport ministry dispatched officials for a quick on-site investigation. BMW is recalling 106,317 vehicles for safety diagnosis and the exchange of EGR (Exhaust Gas Recirculation) modules. BMW officials in Seoul said that due to an EGR defect, the high-temperature exhaust gas is suspected of inflowing into the intake manifold without being cooled, leading to the creation of a hole and a fire on the engine cover. Land, Infrastructure and Transportation Minister Kim Hyun-mee said last week that the government would conduct a thorough investigation, urging car owners to refrain from driving before they get safety checkups. 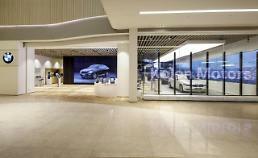 BMW Korea promised to provide broad rental services. Two groups of BMW car owners in South Korea have filed compensation suits. 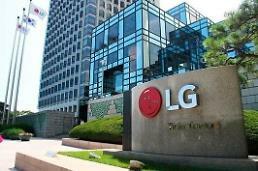 For two weeks from August 13, the Korea Consumer Association, a consumer watchdog, will invite BMW car owners to file a joint suit. On Thursday, 21 people filed a complaint with police, calling for a criminal investigation into six BMW officials in Germany and South Korea for violating the Automobile Management Act.